The PLAYT1 comes with up to 25 hours of battery life, a range of handy features and supports a range of RDS wavebands – DAB, DAB+ and FM. You’ll also find an AUX input socket so you can play music straight from your phone, tablet or MP3 player. If you want to listen to your radio privately, then take advantage of the headphone socket. Roberts has also included a convenient pre-set function. Save up to 60 of your favourite DAB and FM stations to find your chosen station quickly. Not only is the PLAYT1 a fantastic radio, but you’ll also find a useful alarm clock feature. Wake up to your favourite DAB or FM radio station and start the day with a smile on your face. You even have the option to repeat the alarm daily, on weekdays or on weekends. If you need a few extra minutes to wake up, simply select the snooze function and catch up to 20 minutes more sleep. 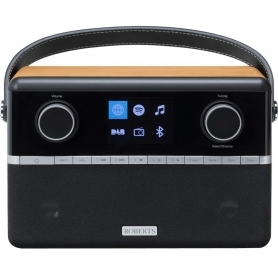 Plus, you can adjust the backlight on this Roberts DAB radio to six different brightness levels – ideal for your bedside table. Coming with a silver and black ash wood veneer finish, the PLAYT1 will suit any room in your home. From the bedroom to the kitchen, it will fit in beautifully wherever you go. You’ll also find a graphic colour display, where you can pick between an analogue and a digital clock. Whichever you prefer, you can enjoy the easy to read display. Listen to a wide range of radio stations and music wherever you go. 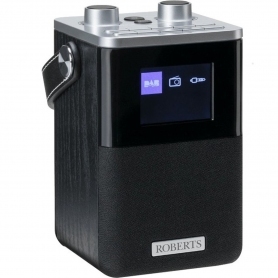 Buy your Roberts Radio PLAYT1 today.